During its almost 35 years of working for conservation, the Michigan Wildlife Conservancy has played a major role in many complex wetland restorations. 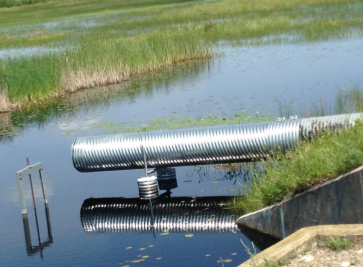 But sometimes great benefits to wetland wildlife came from just a little tweaking--a dike extension or a water control pipe was all that was needed to produce the right mix of open water and vegetation that waterfowl and other wetland wildlife need. A good example was a project initiated in 1985 at the Houghton Lake Flats site in Roscommon County. The DNR and the Michigan Department of Transportation had created a large wetland complex just west of the state’s largest inland lake in the 1950s to offset some impacts of construction of the U.S.-27 freeway. The resulting wetland included 320 acres between the freeway (on the west) and Old U.S. 27, just north of M-55. But better water control was needed to foster “hemi-marsh” conditions, a 50:50 mix of well-interspersed vegetation patches and open water. Research has shown hemi -marshes are preferred habitat for numerous species of nesting water birds. Water control allows managers to add or drain the water to mimic natural cycles that keep marshes from becoming “overgrown” with emergent plants like cattails, or conversely, lacking enough vegetation to protect duck broods and harbor the invertebrates that are important as food. constructing a short (150-foot) dike, installing a new pipe with a control gate at a pumping station, and repairing two other control gates. Today, the Houghton Lake Flats site has an observation platform built by multiple partners, and is considered one of the best and quickest wildlife viewing stops in mid-Michigan. Within 15 minutes of exiting the freeway, an observer in spring and summer has a good chance of viewing several species of ducks, a nesting osprey, Canada geese, a bald eagle, rare black terns, and a host of other kinds of wildlife.